The Lagan Piling companies, FKL and DEW, worked together on a prestigious project to extend the Royal Welsh College of Music and Drama. The value engineering scheme for main contractor Willmott Dixon combined CFA bearing piles and sheet piling. The scheme was engineered to take account of an adjacent dock feeder canal and the busy college adjoining the site, and was complicated by restricted headroom in places. The work was carried out to a predetermined sequence to assist Willmott Dixon in their follow on works, requiring close co- ordination between the site supervisor and site managers on a daily basis. 321no 450mm diameter CFA bearing piles for loads up to 1250kN in compression were installed using a Soilmec rig to pile depths typically of 12-15 metres. The CFA piles were founding some 6-8 metres into the underlying mudstone. The site itself had six different platform levels to suit varying cutoff levels of piles. 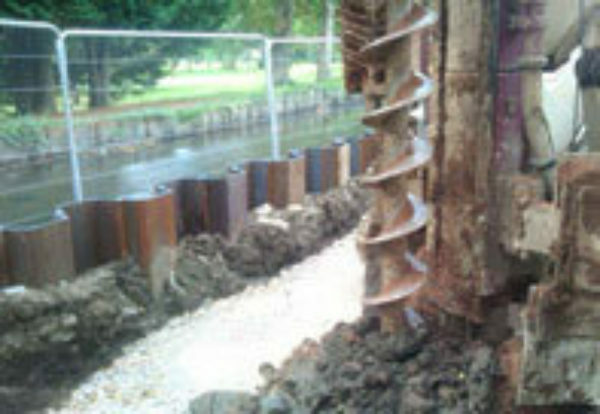 The sheet piling was designed to protect a dock feeder stream which runs adjacent to site and a pile cap adjacent to an existing building. 40 linear metres of sheet piling was installed in three sections using a Movax rig with a 700N Air Hammer. The piles were KSP3Ws ranging in length from 6-10 metres.